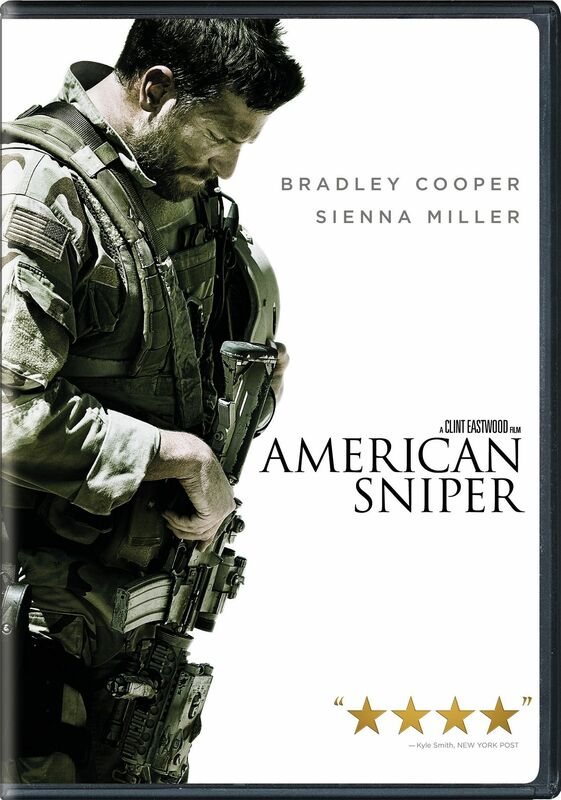 American Sniper is based on the story of Chris Kyle, the Navy SEAL who served four tours in Iraq and became the most prolific sniper in US history. Brought up in a strict God-fearing, gun-toting Texan family environment, Kyle (played as an adult by Bradley Cooper) has nevertheless rather gone off the rails by the time we meet him in adulthood, wasting his time on booze, bucking broncos and broads. The solution? He decides to replace his Stetson with a helmet. Intensely patriotic, Kyle enrols as a Navy SEAL and is soon going through the rigours of an intense beefing up programme, catching the eye of future wife Taya (Sienna Miller) along the way. Soon Kyle is in Iraq, engaged in numerous hugely dangerous combat missions, often involving shooting potential terrorists from great distances. Kyle’s efforts soon earned him the nickname “Legend” amongst his colleagues, but to its credit, Clint Eastwood’s film does not attempt to glamorise Kyle’s unpleasant, hazardous and ethically dubious work. The real difficulties of family life for a warrior are also laid bare with Sienna Miller excellent as the long suffering wife and mother back home. Cooper is also impressive as Kyle, an inarticulate but apparently moral man who often seemed more at ease in terrifying combat situations than he did with his family on leave back home. This is a well made, memorable film which continues Eastwood’s latter career as a great director. It would be an incurious soul who did not have a few doubts about the film’s political position though. For example, Kyle is seen first going into Iraq only two scenes after he and his wife witness the 2001 World Trade Centre attacks on TV. The casual viewer would be forgiven for thinking Saddam Hussein’s Iraq was actually responsible for the attacks, hence making the US intervention in Iraq logical and necessary. This myth is, of course, believed by many to this day: perhaps Kyle believed it sincerely himself. But the reality is Iraq had nothing to do with September 11th whatsoever. It is difficult to feel Kyle’s actions, however brave they may be, are wholly necessary when the reasons for the US being in Iraq were so dubious in the first place. Similarly, few non-American viewers could watch this without being struck by the crazy attitude towards guns. Kyle himself is shown being encouraged to use a gun from childhood, he does the same with his own kids. At another point, in what is supposed to be a playful scene, Kyle even jokingly points a (presumably unloaded) gun at his wife, ordering her to “drop her drawers”. His wife is as amused by this as he is; it isn’t even a cautionary scene. But without wishing to spoil anything, the proliferation of guns in US life leads directly to one personal tragedy during the course of the film. This in fact presented as more as down to pure bad luck: the fact that it would never have occurred if the populace were not so heavily armed in the first place, is totally glossed over. 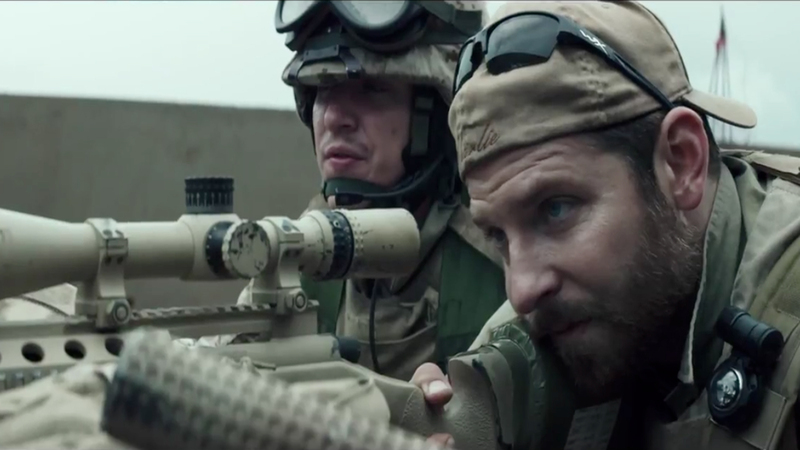 Yet despite the politics, American Sniper is a genuinely good film, a worthy addition to Clint Eastwood’s directorial portfolio and featuring at least two first class performances from Bradley Cooper and Sienna Miller.